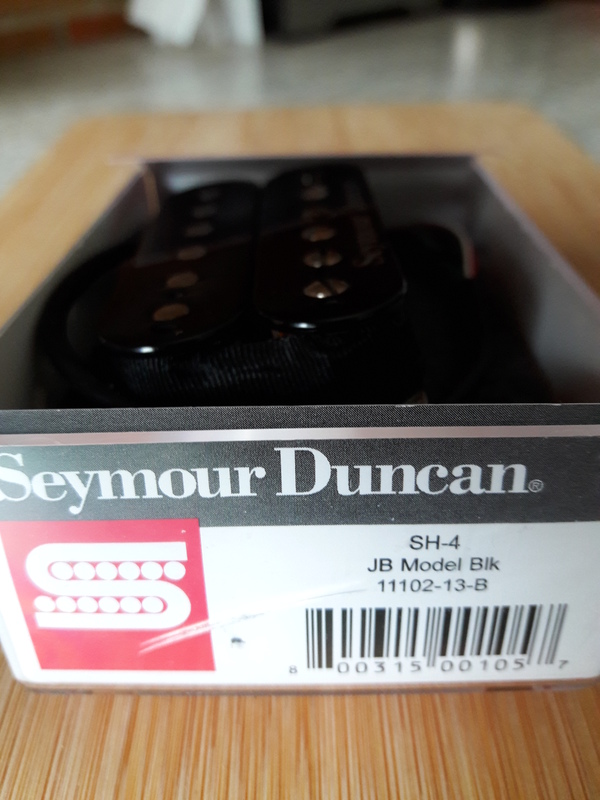 tjon901's review"One of the most popular aftermarket pickups"
Seymour Ducan is probably the most popular aftermarket pickup maker in the industry and this is probably their most popular model. The JB is pretty much the standard when it comes to hot rodded humbuckers. Put this in just about anything and it will really wake it up. There is no wonder why so many guitar makers put these pickups in their guitars. From ESP to Jackson you can find models that use the Seymour Duncan JB usually paired up with its buddy the Jazz in the neck. These pickups can make just about any guitar sing. This pickup is more eq'd on the high end for clarity. Because of this these pickups work best in guitars with darker woods. The output is about 16k so this pickup will drive just about any amp. You see these pickups in a lot of Les Paul style guitars because they can add some crispness to the naturally dark sound of those guitars. 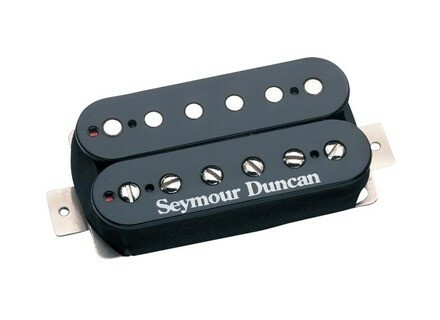 Seymour Duncan even goes as far as to say mahogany guitars with rosewood fretboards. I dont think I would go this far but a darker wood like mahogany is really the best pairing of wood with this pickup. 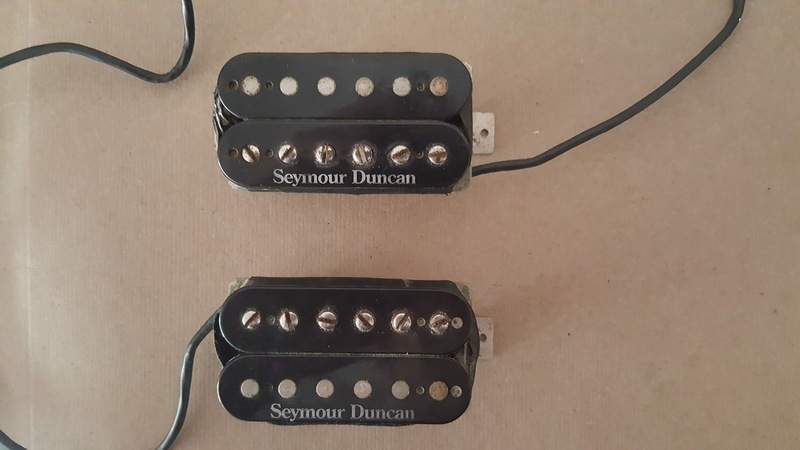 You also see these pickups in shred guitars like Jacksons because with their high end bite and tight low end you can get a metal chug yet still have singing high end with the pickup. Even with this, this is not the first pickup I would recommend for a bright guitar. A bright guitar with a bright pickup can equal painful ears when played out. It doesnt have a huge amount of bottom end but what it has its really tight. The high end is nice and crisp and you can get it to scream if you want. If you are looking for a good all around humbucker replacement for the bridge of your guitar this is what everyone else is using. wwhhhaatt's review"Maybe just not for me"
This pickup came stock in my ESP Stephen Carpenter 6 string which has an alder/maple body with a maple neck and ebony fret board and my ESP Eclipse which has a Mahogany body, maple neck, and rosewood fret board. My main amp is a framus cobra 100 watt tube amp and I also used a peavey 5150 and hughes & kettner triamp. I mainly play a mix of rock, metal, and very pedal effected looping. When I first plugged in my SC6 I thought there was something wrong with it. The sound was just thin with tons of irritating treble and no real meat to the sound. The attack is great for cutting in a mix but the lack of fullness behind it just makes it sound like a stuck wah pedal to me. I tried a lot of different EQ settings on my amp to compensate but never really got a sound I liked. The wood combination of alder and ebony is a bit bright so I figured maybe it just wasn't a good match for this guitar. Using lower tunings made the pickup sound a little better to me but I never go below a c# so it had to go. A few years later I bought the eclipse. The eclipse having the standard LP woods I figured the pickup would sound much better than my experience with the sc6. It was slightly better but still not for me. Fast leads sound good and it had a bit more low end compared to the SC but I still found it overly bright with a kind of stuck wah "quack" sound and not very full. Also as with the SC6 I thought the pickup sounded pretty good with real low tunings. King Loudness's review"A great sounding, but choosy pickup." 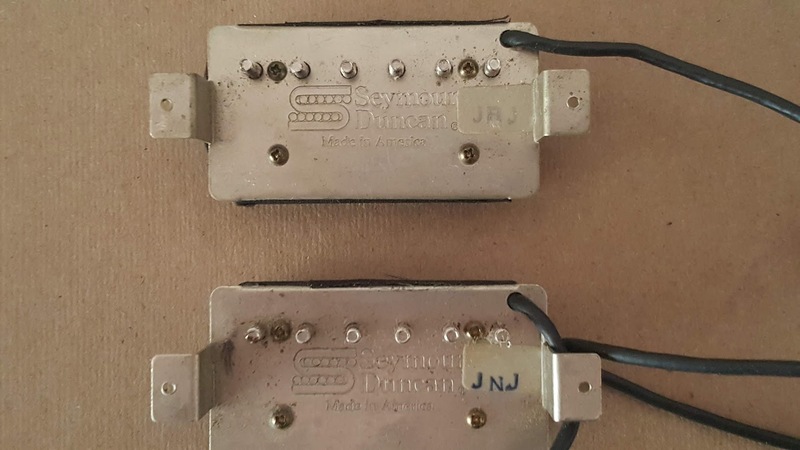 The Seymour Duncan JB (JB standing for Jazz/Blues, NOT Jeff Beck as many people think!) 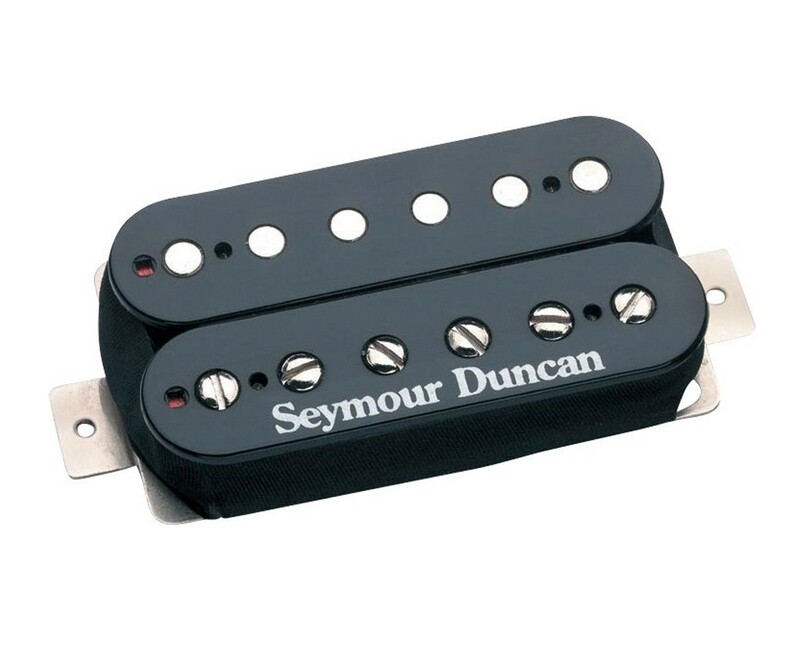 has been a mainstay in the Seymour Duncan line of pickups along with the '59 and Jazz. It's a very good sounding pickup overall and that's the reason you can find it stock in a lot of guitars today. However, it is my opinion (and apparently many others' opinion as well) that this pickup is very picky/choosy when it comes to the wood it's being mated with. I'd take that one step further and say it's not just the wood being used, but it's also got something to do with the body shape and quality of the wood being used. In some guitars it has a great L.A rock type sound with a round bass, nice biting top end and scads of gain. However, in other guitars it can sound thin, weak and have no definition with higher gain settings. Case in point, I've owned two guitars in the last year that have come with the JB stock as a bridge pickup. One was a 2010 USA made Charvel San Dimas with an alder body, quartersawn maple neck, and an Original Floyd Rose tremolo. The other was a 2009 USA made Jackson King V Select with an alder body, maple neck with ebony fretboard, and an Original Floyd Rose tremolo. I would have definitely thought that guitars with such similar specs would sound very similar and hopefully have that biting top end and thick low end that I really like from this pickup. The Charvel hit home on all fronts... it was to me a prime example of a great sounding L.A rock machine, and the JB in the bridge just had this beautiful, snarling attack. The Jackson, by comparison, was a complete and utter letdown. For a guitar that had such similar specs, I was absolutely shocked at how thin, weak and lifeless the JB sounded. It had none of the aggression that the Charvel did, and there was a serious lack of sustain as well... definitely confusing. All in all, I would say if you are looking to buy this pickup, tread with caution. Though it CAN sound great, it really does depend on the guitar you are using, and as my experience shows, similar specs doesn't mean a similar tone. The JB pickup! One of the most standardized duncan pickups on the market today! Comes stock in the bridge in almost every decently made guitar. Let me just clarify one thing before I go on, JB doesn't stand for jeff beck. It does NOT. A lot of people have confused this for some reason, I don't even know how it began but it's not for jeff beck. Jeff beck doesn't even use this pickup as far as I can remember! It stands for jazz/blues. Ok back to the pickup review. It's a decent pickup, and can be used for many applications. This review will be one for the JB as a bridge pickup, which is what it's famous for. A lot of artists used the JB pickup for a lot of their recordings, so many I can't even begin to name them it'll just take forever! 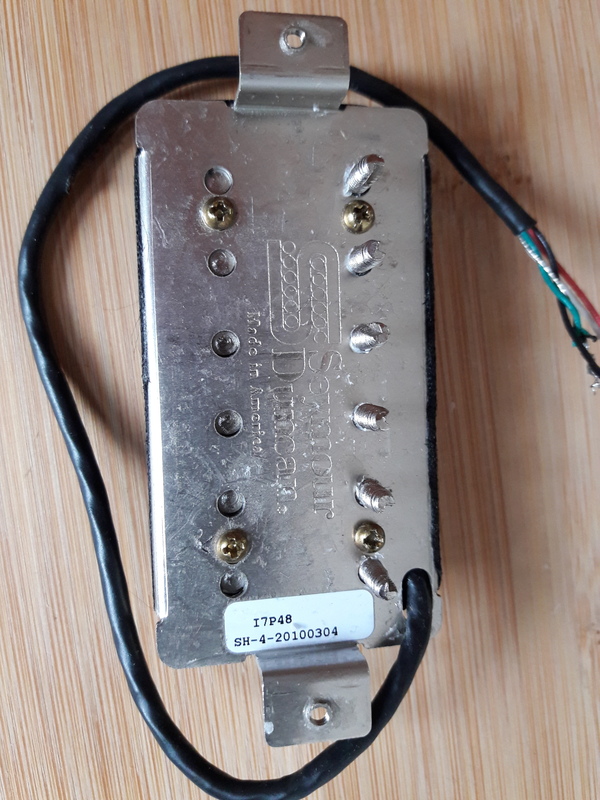 Cleans: As a bridge pickup it's not bad, it's nothing to write home about either, it's relatively clean, doesn't break up and is definitely a usable clean. But the distortion is where it's at. Dirty: This is what made it WORLD famous. It's sharp but not too sharp, and clear, I'd say it's high output, though it's not as high output as other pickups out there today. Depending on the amp you can get some very tight metal sounds out of this pickup. Again it is tight, and sharp, not flubby. Which, for some people is or isn't good. It depends on the guitar, I think for the majority, most players prefer it in a mahogany-bodied guitar to balance out the bright/sharpness that the JB offers. This is highly famous due to it being a rock or heavier tastes of music type of pickup. I don't personally know anybody that uses the JB for anything else. Andy Timmons used to use this pickup for years and his tones have always been great, and yes I would consider him rock. I've also owned a guitar that had the JB coil tapped, and was not impressed with the tones either. I don't know what it is but it wasn't very musical to me, sort of just flat and lifeless. Overall as i've stated it's a decent pickup, the cleans are good and the distortion is tight and sharp. The harmonics don't fly out compared to other guitars as the gain structure of this pickup seems to be a little different it seems. When I palm mute, the mutes don't come out as strong as if i strummed chords even with the same amount of strength put into it. I noticed this over years of playing different guitars with different pickups. I don't know what it is about the dynamics of this pickup that makes it so, but that's what I disliked about it. But then again it's in almost every guitar from the factory now so it must've worked for a lot of other players before me! It cleaned ok decently with the volume rolled down but of course you'd need to do the treble-bleed mod, I do it on all my guitars now just out of principle. I give it a 7. It's good but it's not perfect, but it's very usable and versatile for rock and heavier music, but not for anything else, even though it's labeled as a jazz/blues pickup.